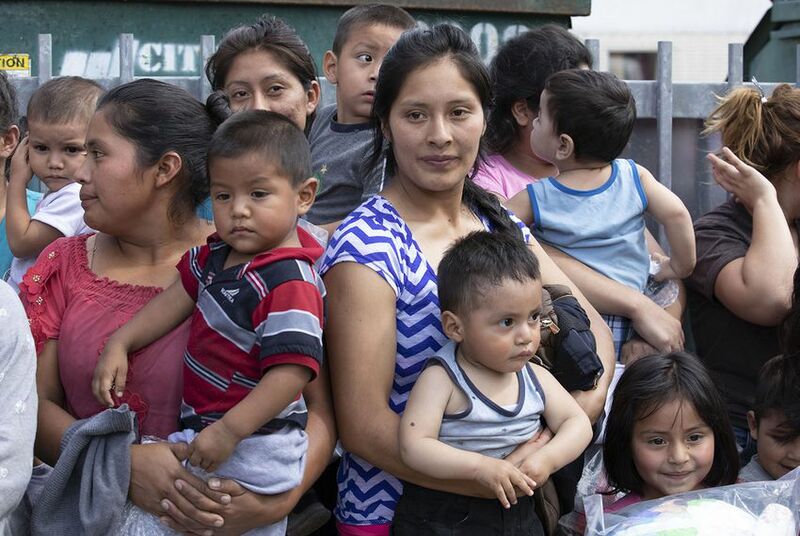 While President Trump vows to end citizenship rights for children born to non-U.S. citizens through an executive order, political analysts and immigrants themselves say that wouldn't deter illegal immigration. MISSION — Isela was pregnant with her first child when she illegally crossed the river from Reynosa into the Rio Grande Valley in 2001. She said she didn’t know much about life in the United States, but was convinced her unborn daughter would have a safer and more secure future across the border. Isela, who asked to be identified by her middle name because she is an undocumented immigrant, gave birth to her daughter in Mission. Three years later, her son was born in McAllen. That granted the children birthright citizenship under the Fourteenth Amendment of the U.S. Constitution. President Donald Trump vows to end this right for children born to non-U.S. citizens with an executive order, something legal experts largely dismiss as unconstitutional. Still, Isela said said it was the prospect of a better life — not her children’s potential citizenship status — that was the driving force in leaving Mexico to start a family in Mission. And, she said, she’d cross the border again even if the Fourteenth Amendment didn’t exist. Life would be even harder if her children were not U.S. citizens, she said, mentioning the challenges she’s personally faced in the United States. Living without documentation comes with a limited job market, the constant fear of being detained and deported, and not qualifying for medical insurance. But she said things could be worse in Mexico. Her kids received a better education in the United States, and they grew up safer. “I would rather have them in the U.S.,” Isela, 44, said. Although there are close to 30 countries with birthright citizenship, Trump’s plan reflects the anti-immigrant campaign he ran on in 2016 and comes just days ahead of contentious midterm elections in which his party is struggling to keep control of the U.S. House. Texas Democrats oppose the idea. Most Republicans in the state’s congressional delegation declined this week to say whether they support the idea. Three of four GOP lawmakers who responded to The Texas Tribune said they back the plan. Trump’s promised order would also be the latest immigration-related executive action since his inauguration, following one that rescinded the Deferred Action for Childhood Arrivals and his so-called Muslim Ban, limiting who could travel to the United States. According to a Pew Research Center study that analyzed data from 2014, an estimated 11 million undocumented immigrants live in the United States. More than 1.5 million live in Texas. And throughout the state, more than 1 million U.S.-born children live with at least one parent who is undocumented. About 75,000 of them are in the Rio Grande Valley alone. Janeth, another undocumented mother living in Mission who asked to be identified by her middle name, said she crossed the border from Reynosa when she was 16 using a tourist visa. She has three children who are citizens, born in Mission, McAllen and Edinburg. Janeth said that an executive order would do little to stymie illegal crossings, because immigrants like her aren’t focused on citizenship. But Gabriela Vega, a midwife at the McAllen Birthing Center, said things would certainly change. Vega estimated that of the average 60 annual deliveries at the center, 98 percent are with clients who cross the border on a tourist visa — a legal entry. Vega said they pay the $1,600 price tag out of pocket. Then they cross back into Mexico with a newborn U.S. citizen who will grow up with the option to legally return to the United States. While liberals and conservatives prepare for another potential fight in the court system, political analysts say that an executive order would be legally questionable at best, and would likely fail in efforts to stop illegal immigration. Charles Olney, a political science professor at the University of Texas-Rio Grande Valley, said if the end goal is to strangle the flow of illegal crossings, the administration should focus on border enforcement, targeting companies hiring undocumented workers and enforcing visas more aggressively. Olney also said that stripping birthright citizenship would create generations of American-born children with no claim to citizenship. He said the health, financial and educational burdens on immigrant communities would be severe: child poverty rates would increase, money would be funneled away from under-resourced areas like the Valley and local economies could be crippled. “Some of the unanticipated consequences could be catastrophic,” Olney said. Disclosure: The University of Texas - Rio Grande Valley has been a financial supporter of The Texas Tribune, a nonprofit, nonpartisan news organization that is funded in part by donations from members, foundations and corporate sponsors. Financial supporters play no role in the Tribune's journalism. Find a complete list of them here.